As a member of the graduating PT class of 2016, I’m starting to recognize some of the ways in which my practice has developed over the past year. I now have a deeper well of experience from which to draw to help guide clinical decision making and fill in gaps of knowledge that can’t be obtained from textbooks. I’ve learned the virtues of not letting my clinical successes get to my head or being too dispirited when patients don’t improve. Like many new grads, however, I cannot claim to have it all figured out and I still feel like I’m climbing the learning curve and defining how I approach the practice of our profession. Precisely because I feel that I’m still in a developmental stage at this point, I wouldn’t consider myself to be the ideal clinical instructor. When my manager approached me to see if I’d be interested in being a CI to a student in their last internship, I was reluctant at first, despite having allowed students to shadow me for a day and subbing in as a CI while other therapists were on vacation. To borrow an analogy from one of my favorite stand-up comedians, John Mulaney, I felt like the situation would be akin to hiring a horse to take care of a dog. In my affiliations as a student, I appreciated structured time on a regular basis to reflect on the week and make specific goals for the next one. However, one of my main priorities going into the experience, was to respect my student's personal learning style. Laura assured me on her orientation to my clinic that she wouldn’t need a regular check-in about goals and reflecting on the previous week, and that she learned in a more improvisatory and experiential style by being thrown into situations. While Laura, who had just come from another nine week internship, was used to the paces of being a student and felt comfortable going into the experience without structure, I regret not scheduling weekly check-ins for my first time as a CI. My schedule was starting to enter a particularly busy period, and I found myself delegating responsibilities to Laura on an ad-hoc basis rather than steadily increasing them at an appropriate rate. Additionally, it became difficult to find time during breaks or after work for practice with examination and manual skills that clearly required some review. Even if you’re already a formidable PT as a new grad, it’s unlikely that you’ve spent significant time reflecting on how or why you practice the way you do or considered how to best articulate the methodology behind your work. With my first student, I regrettably did not spend enough time thinking about how to frame my initial evaluations and treatments in a way that respected what my student already knew while amplifying aspects that may have been learning opportunities. Instead, I resorted to a technique that I remember not finding very beneficial as a student: asking if there were “any questions” after the fact (while treating and examining as I usually would). However, even with this approach, a student will have spent so much time observing you that they will pick up manners of communicating with patients, habits of structuring and sequencing treatments/IEs, as well as implementing exercises and manual techniques that they found appealing. The last lesson on the challenges of communicating knowledge can result in a CI’s self-reflection on how they know what they know. This process can have the additional effect of bringing to light knowledge and skills you didn’t realize were acquired since graduating. Even the brightest and most precocious of students don’t have the tools or confidence that as little as several months of working a full-time entry level caseload affords. Bailing them out during an awkward long pause on an IE or chiming in to reassure a TKE patient that persistent pain weeks after the surgery is normal and not necessarily anything to be concerned about will make you realize how far you’ve come. Having a student is in some ways like having an external consultant observing and judging how you do your job. Even if they don’t always have enough knowledge to provide constructive criticism, they can recognize when you make errors and can have a good sense of your relationship with your patients. They may compare your abilities both as a PT and a CI to previous affiliations. As a new grad CI, you might also be a resource for navigating issues that are essential to student PTs about to enter the profession. This doesn’t only apply to students on their last affiliation. Second-year students whom I’ve taught are already pondering whether or not to take the NPTE early, what clinics and settings offer the best salaries for new grads, the job application process in general, and how to manage student loans. Curiously, I’ve found that third year students are concerned with more imminent matters such as graduation costs, what neighborhoods are attainable on a new grad salary, the licensing process, and whether to apply for a temporary permit. It’s virtually unavoidable in an educational situation as intimate as the student-CI relationship to not evaluate performance without comparing the student to yourself. This is especially true for a new grad CI, with all the experiences from internships still fresh in your head. 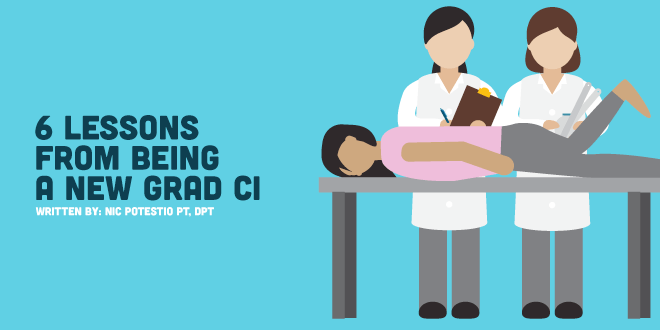 Consider the disappointment of a CI who as a student diligently prepared for their clinicals by reviewing lab techniques and memorizing protocols before even starting. Conversely, students that are particularly talented and likable may be intimidating to a young CI who’s still not 100% confident in their abilities. In a general sense, every developing clinician has a unique destination and a different pace to reach that destination. The role of the CI shouldn’t necessarily be to set their own standard for the student. Instead, a CI should ensure that the student reaches a level of professional competence to prepare them for life as an entry level PT and to protect our patients, while also acknowledging the student’s own goals (destination) and unique qualities (pace). If your first experience as a CI is like mine, you may come away from it with a sense of reward and a boost in productivity as well. I am now already working with my second student and trying to apply some of the lessons learned from my previous experience with Laura.